The dark before the dawn: the beginning of a great obsession! As part of the blog writing course that I am currently undertaking, I must write a review. 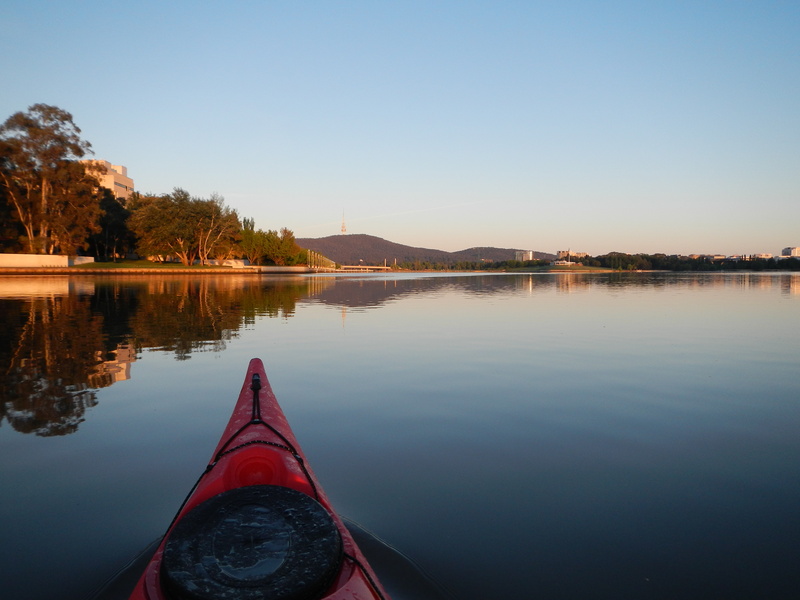 So I thought I would review Lake Burley Griffin; what started me paddling; and the head space that it provides me on a daily basis. Last August I was in the third stage of an intensive three month blast of chemotherapy. On one day in particular I came across a photo of a sea kayak while I was surfing the internet. I had always entertained the idea of kayaking so I thought I would follow up on this idea. At the end of my 7 hour stint of receiving my daily dose of DDT I decide to drive past a kayak shop and have a look. I’ll never forget this day. I walked into the kayak shop and the young shop assistant had a stunned look on her face; in hind sight when I look back at the photos of me during this stage of the treatment, I would have described myself as a walking zombie; bald, pale, thin and emaciated. At this stage of the treatment you are just totally wiped out by the chemicals that are poisoning your body and mind. Anyway I walked in determined to purchase a kayak, but instead I ended up walking away with two. I thought I could share the experience with my 16 year old son, a friend or maybe even my wife. I had only surfed before but never paddled a kayak. I had no idea if I would like it or whether it was just going to be one of my fads. 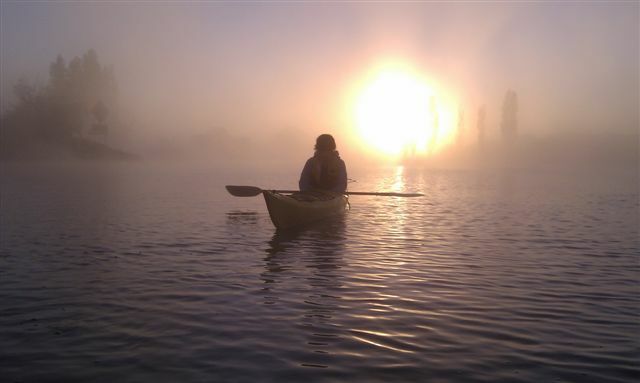 As I was still undergoing chemotherapy I knew that I would not be able to paddle for a few months. It’s funny the reaction I initially got from everyone. It was along the lines of…”WHAT! Have you gone mad? Are you serious? The chemo is definitely affecting your brain.” I was so determined to give it a go despite feeling depleted of any energy. This was my light at the end of the tunnel (and it wasn’t a train), I wanted to do this as a way to rebuild my mind and body. Your mind and body take an absolute pounding during this process. You end up with what they call ‘chemo brain’ it’s awful. You end up scattered, dyslexic, unable to think straight and have problems processing the simplest of tasks, not to mention brain splitting headaches that go with it as well. Physically you are stripped of anything and everything and by the end of it you are just like an empty cicada shell. The daily injections take havoc on your hands, the overwhelming urge to constantly want to vomit, the rage from the steroid tablets, the mouth ulcers which make eating even more of a arduous task. As if it wasn’t bad enough with all the nausea, the blisters that are lying underneath the palms of your hands create pain every time you touch something; the constant tiredness in which you have to drive yourself to get out of bed every hour for three months to race to the bathroom. There is so much more but I am not going to go on. If you have been through it you will understand. If you haven’t, well I hope you will never have to experience this. So on the 19-10-2011, Tully and I took off for our maiden trip on Lake Burley Griffin, and it was the start of something brilliant. I quickly discovered how stunning it is to be on the water looking out – rather than in; Canberra looks totally different from this perspective. 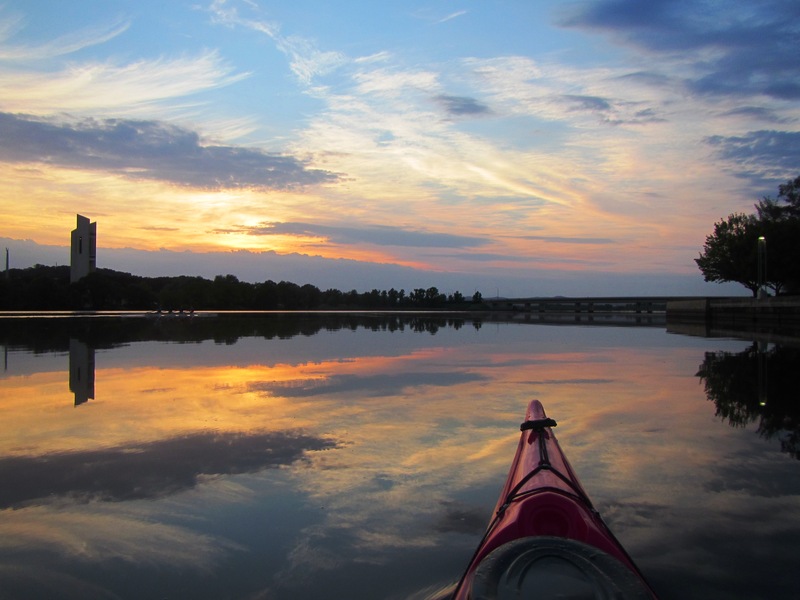 I quickly became addicted to this sport and I was soon paddling every morning wanting to catch that sunrise. 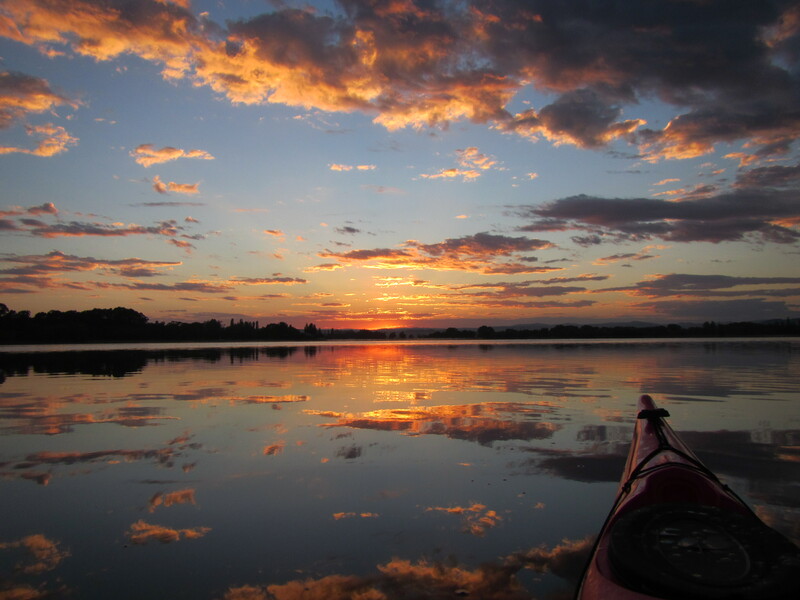 Canberra has the most amazing mornings as they are generally calm which makes for smooth paddling. These conditions make it feel like you are paddling on a sheet of glass and also make for great photo opportunities. 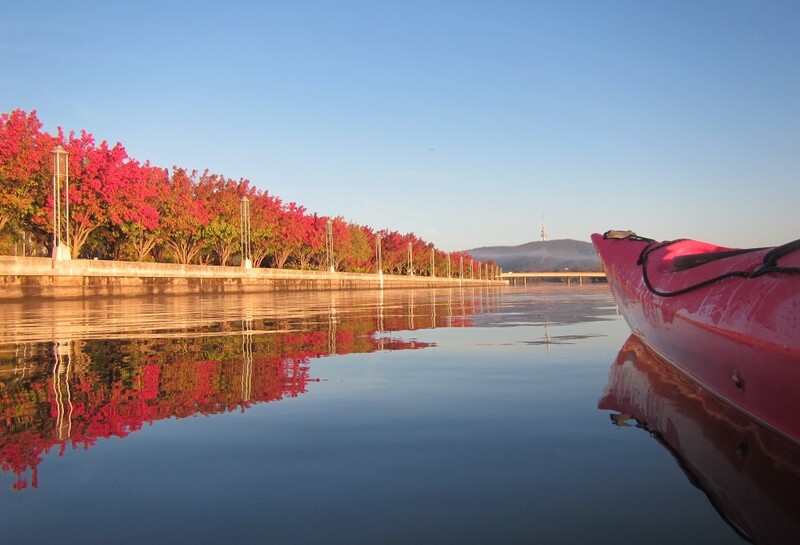 A major advantage of paddling Lake Burley Griffin is the numerous locations which you can set off from. These include Lotus Bay, Yarralumla Beach or Western Park. From these points you can paddle through the West Basin down to the rowing lanes, past the Governor Generals House onto Scrivener Dam. You can also start from the East Basin near the ‘Boat House’. From here you can tour the Main Basin taking in all the National Capitals iconic buildings such as the National Carillion, National Gallery National Library, High Court, New and Old Parliament House and paddle under the Commonwealth Bridge. 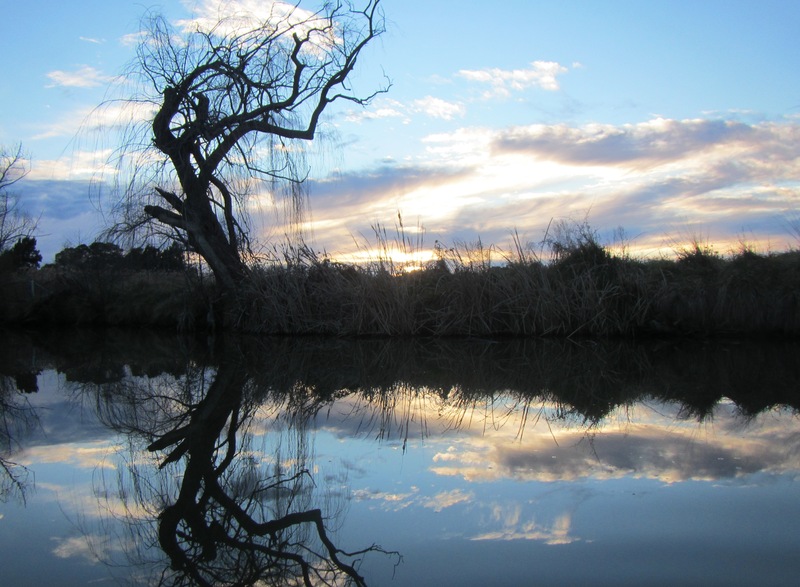 Alternatively you can take a trip up the willow lined banks of the Molonglo River. Another different place to visit is the Jerrabomberra Wetlands, this is a little jewel nestled within a 5 minute trip from the CBD. Lake Burley Griffin offers so many options with varying backdrops which allows for a different scenic route each day. One of the harder things we encounter here in Canberra are the sub zero temperatures. This can create doubt in your mind when you are driving down to the lake on a frosty minus six morning; You know it’s cold when the water turns to ice on the kayak hatch! But it’s all worthwhile once you’re out on the water. I have experienced some of the most mind blowing winter paddles. Some mornings are blanketed in fog and you can’t even see two metres in front of you. I love the headspace when I am out on the lake. There are no phones, T.V or commercials blaring. Every day I have my own counselling session out there and I always return calm and relaxed with a huge smile. This is one of the many reasons why I love my daily paddles as it gives me peace and contentment. I began taking photos to capturing the sunrises and sunsets as the colours and reflections are unbelievable. A good friend of mine summed up sunrises and sunsets; “It’s a gift, the start of a new day and a great big thank you at the end. The universe is truly an elegant place.” All of the photos that I load have not been digitally enhanced. That is what it’s all about for me, some people don’t believe this but that’s their choice. I highly recommend you visit Lake Burley Griffin, whether you experience it by kayaking, sailing, sculling, dragon boating, or paddle boarding. You will not be disappointed, but one word of warning…..”It can be extremely addictive”. 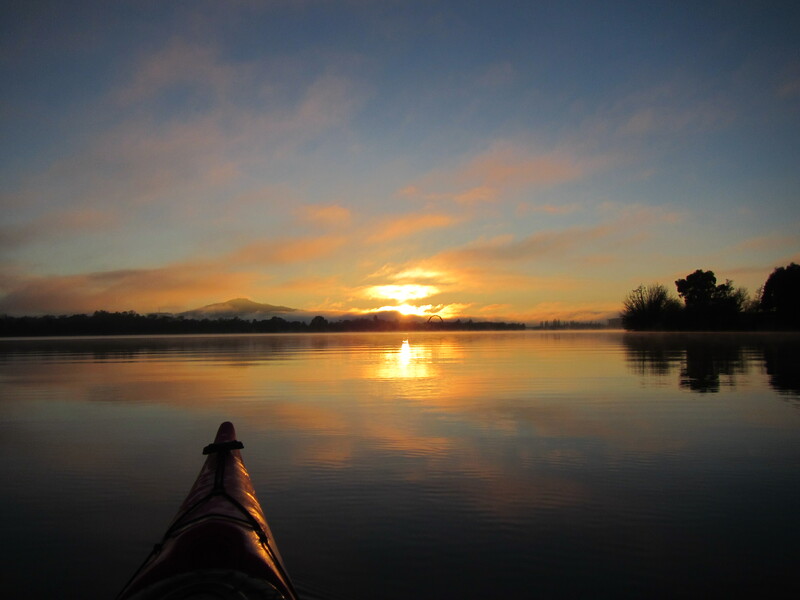 This entry was posted in Canberra, Canon Camera, Kayak, Lake Burley Griffin, Paddling, Sunrises, Sunsets, Uncategorized and tagged Sunsets by kayakcameraman. Bookmark the permalink. Well it is with enormous respect that I say you do not snap off a few shots! These are stunning – For all kinds of reasons we mostly paddle Lake G – mostly I see LBG from the shore in the early morning so a great big thank you for the inspiraton! Hi Percita, That is the greatest compliment you can pay me; I thank you. I look forward to crossing paths when you are out on the water or during your boot camp session and having a chat. I’m glad you like the photos. Enjoy your blog and the photos. We live near Lake Burley Griffin and I’ve been missing it while we have been travelling in South America. Thanks for sharing such wonderful imagery. I might have to take up kayaking when I get home. Hi leggypeggy, I’m glad you like the photos. It’s great that you can connect with Lake Burley Griffin through the photos while you have been travelling overseas; It is beautiful out there most early mornings (as you know yourself). Safe travels and I hope to see you out there when you return. Sounds like a plan. I’ll watch out for you on the lake. Am thinking of selling my under-used pilates machine and buying a Kayak. 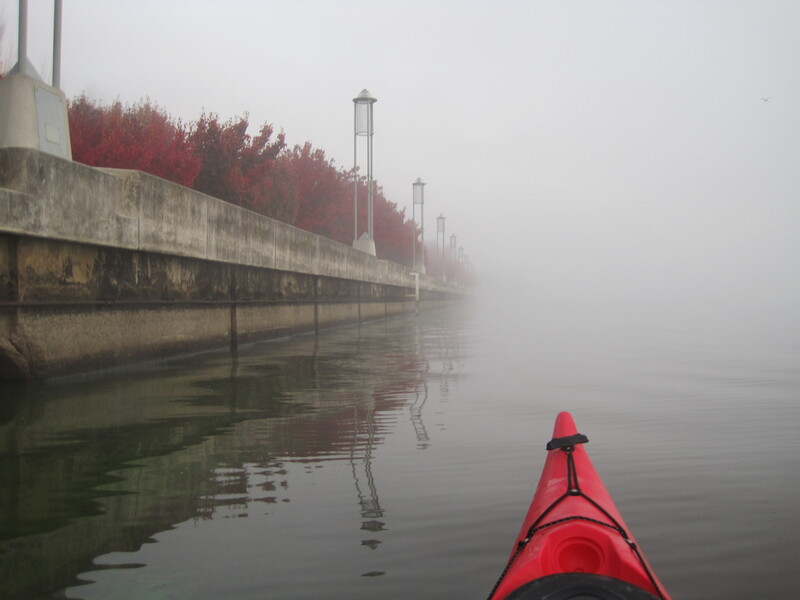 What sort of Kayak did you get and what camera do you use? Do you have it in a waterproof housing? Truly inspirational photos and story, a joy to look at and will be sharing your blog with friends. I have a few kayaks but the ‘Red Chilli’ is a Riot Brittany sea kayak. There are so many options available. The best thing to do is to contact a kayak dealer and see if you can test paddle a few different styles and models. Most kayak dealers offer this option. This way you will be able to form a better idea of how they perform and if you feel comfortable in it. The camera I use is a Canon Powershot D20, it’s an underwater camera, so I don’t have to worry about getting it wet etc. I am looking to upgrade but I still can’t decide. I have narrowed it down to two…maybe three. Yet again, there are so many options out there. I am so happy that you like the shots and blog. Thank you for sharing it with your family and friends and promoting the site. Much appreciated.